Cruising World Magazine announced their Boat of the Year Winners (BOTY) today. The New Beneteau 34 was the receipient of the Best Value Category. We are very exited for this boat on Lake Michigan as she competes in a size range that has been strongly represented by Beneteau models on Lake Michigan. Another Beneteau the 43.3 which is Moorings version of the Beneteau 43 also won the award of "Best Special Purpose Cruiser". Newport, R.I. – Cruising World magazine announced today the winners of its 16th annual Boat of the Year awards. Topping this year’s list of winners for the most anticipated awards in the sailboat-building industry were the Island Packet 460 and the Malö 37 Classic. The IP 460 took home the Domestic Boat of the Year award, while the Malö was named Import Boat of the Year. The Island Packet 460, the Malö 37 Classic, and six other boats won awards from an independent panel of experts who inspected and tested 21 nominated boats during the U.S. Sailboat Show in Annapolis earlier this year. Decisions were based on extensive inspections and sea trials of the boats. All of the winners, along with the rest of the ’09 BOTY nominees and several other boats reviewed by the magazine’s editors, will be featured in the January issue of Cruising World. Following their deliberations, the judges decided this year to add an award for Best Value. Taking home this honor was the Beneteau 34. “The Beneteau 34 was the least expensive and one of the smallest of the cruising boats we looked at, yet under sail was a pure delight and handled well in the rather boisterous conditions we encountered,” said Pillsbury. In addition to claiming the Domestic Boat of the Year award, the Island Packet 460 was also named Best Long-Distance Cruiser. The Scandinavian-built Malö 37 Classic was named Import Boat of the Year for its performance on the water and luxurious attention to detail throughout. Other noteworthy categories and their winners in the 2009 BOTY competition: Best All-Purpose Cruiser, 30 to 40 Feet: Catalina 375; Best Midsize Cruiser: Dufour 40 Performance+; Best Full-Size Cruiser: Dufour 525; Best Racer/Cruiser: X-34; Best Special-Purpose Cruiser: Moorings 43.3. For more information on the winners and other nominees, please visit Cruising World’s website (http://www.cruisingworld.com/). Cruising World, published monthly by Bonnier Corp., is considered the bible for bluewater sailors. Cruising World nurtures cruising sailors’ dreams with practical how-to information and stirring real-life adventure articles. We are quickly approaching the end of yet another year in our lives. As is typical at this point in the year, people start to reflect upon what 2008 gave them and set what we colloquially refer to as 'resolutions'. You know the type- "I will lose 20 pounds" , " I will exercise". So often these 'lists' get shuffled in a drawer some place and by Valentine's day, all is forgotten. At the end of it all, the health clubs sell memberships and we get no closer to self improvement. Wouldn't it be great if 2009 was different? Wouldn't it be great if you set a list of things to do that actually meant something? To you and to those around you? After all, we have a limited amount of time on this great planet of ours and we never know when our ticket will get punched. It's funny but many don't have this realization until they are faced with a terminal illness or perhaps when their world is turned upside down through the loss of a loved one. Why does it have to take such pain or finality for us to value what we have and live our lives fully? In 2002, I remember having conversations with clients regarding this very subject. For some, it was the post-9/11 period which had many question what their lives meant then and whether or not it was heading in the direction they had planned. For me it was at an earlier age, It was the summer after high school when I first informally touched the subject of 'a bucket list'. My crudely generated 'things to do before I die' set forth my bucket list (more on this later). I was on the verge of having my life unfold at the age of eighteen so I couldn't think of a more . The way I saw it- I had my whole life ahead of me- what did I want it to be? I've since refined my bucket list from its very simple beginning. I've modified it to define what type of father I want to be to my children. What type of husband. I've used it as the backdrop for my 'December thoughts' which is what I refer to at this time of year. I will look at my list , see if I've gotten closer and chart a path for the upcoming year. In my corporate life, we called this the 'goal setting'. It doesn't have to be as formal as it sounds. Nor does it have to be final. It just has to be. I had the opportunity to watch the 2007 movie "Bucket List" with Academy Award winners Jack Nicholson and Morgan Freeman. They play two terminally ill men who meet and strike up a most unusual relationship (a great movie BTW). Nicholson's character, Edward Cole has the most memorable line of the movie: "We live, we die, and the wheels on the bus go round and round". That line says alot about how some live their lives- full of regrets. Day-to-day. Why not change that? So I pose this question to you. Will 2009 come and go and the wheels will go round and round or will you make it mean something? It shouldn't take a bad health report from a doctor's visit or any other tragic moment to have us realize what our lives mean to us and those around us. So what is on your bucket list? Post your comments or email them to me. Would love to hear from you. As I stated, I've modified it since this original list. So every year I challenge myself. I have always loved the holiday season. For 15 years I worked in the music/entertainment industry, and Thanksgiving to New Year's was the busiest, most profitable time for everyone involved in that business. Usually that period accounted for about 25% of the year's profits, so spreading Holiday Cheer was secondary to profits, but I still found a way to always do both. The key for me was the fact that these movies and CD's were always playing around me, from 8am until 9pm, so it was easy to get in the holiday spirit. Over the years I compiled quite a collection of holiday movie and music favorites to watch/listen to over and over again. I would like to share them here. I am sure everyone has their own favorites and for their own reasons, but these are mine and I will probably try to watch most of these during December. I do have an affinity for the older stuff, but I also enjoy and embrace the new movies and music as well. During December, there's really nothing better than sitting in front of the fire with a Baileys and coffee, and one of these movies on the TV or one of these CD's on the stereo. Note: I came across this article through a subscription RSS feed. It caught my attention because it speaks of the essence of boating. As sailors we are very familiar with these concepts, but it is easy to become seperated from them during the winter months when it seems like ages until we sail on Lake Michigan. Our latest trend of media negativity further deepens the gap between the world we presently live in and the passion we all share. This essay is being presented here with the permission of the author Barb Hanson. Thank You Barb for sharing your words with us. I hope it brightens your day and puts some perspective on things. You know something is not right when you say "Good morning" and the other person dourly answers, "I wish." Why the negativity, I wonder. Well, if somebody has lost a job or a family member, I get it, but this person hasn't lost his job. He hasn't lost a family member. He has just bought into the malady that is sweeping the nation – gloom and doomitis. Yes, the news of late has been rather depressing. The business slowdown, the rising cost of living, the loss of jobs… When you do the math it’s not a pretty picture. I don’t think there is any sector of our economy that has not been down except, perhaps, sales of antidepressants and alcoholic beverages. I was recently reminded of the story of two young boys who were each put into a room where doctors could observe what made them happy. Billy was put in a room full of toys, games and candy while Jimmy was put into a room filled with horse manure. It wasn’t long before Billy had played with all the toys and games and had eaten all the candy. He started crying for more. Meanwhile, Jimmy was playing with the manure, making it into balls and tossing it all around the room. The doctors were astonished. Finally, they asked Billy why he was so happy in this room by himself. He said it was because he knew with that much manure in the room there had to be a pony around there somewhere! Right now it’s hard to think about anything positive when we are surrounded by so much that is negative. When everything we read is bad news and everything we watch is bad news, it’s easy to just feel bad. When I tell people that I’m in the yacht charter and yacht school business, the response is often wide-eyed like, "Wow," or "How cool!" And it is, even when I'm dutifully at my desk and computer. But just about every week I try to get on the water on the boat. Even a short ride across the harbor in the sunshine and fresh air is good medicine for me. I am not a real doctor but I sometimes play one in this column and this is my considered medical advice for our nation’s malaise. Go down to the water's edge and catch some sunshine. And if you really need a stronger dose, then my prescription is to get in a boat and push away from all of that land-based negativity. Oh, sorry, I just can't, says Mr. Busy. There's no time, says Mrs. Hurry. I have things to do, places to go and people to see. There’s no time left for me. Thanksgiving is just around the corner. Take this long weekend of opportunity to find the fair winds and calm seas of your mind amidst an ocean of worries and woes. Get out on the water if you can. or a milestone birthday. There’s something celebratory about boating. Even in a season of doom and gloom, we have much to celebrate. Marinas, I have observed, are like Billy and Jimmy’s play rooms. Some people need a big expensive yacht to make them happy and some boaters are happy with just a kayak or canoe. It’s not the vessel that determines their happiness; it’s what they experience with it that gives them pleasure. My husband has always said, "If your head is on right, a tin cup can be a silver chalice. It’s all about how you look at life." Boating keeps our heads on right and lets us see the brighter side of our awesome world. The Changing Face of Sailing. A recent editorial by Wanda Kenton-Smith in Trade Only titled "At last, they’re beginning to get it: it’s not just a white male market" broached the subject of diversity in the 'boating industry'. It's a topic near and dear to my heart for obvious reasons and on several fronts. As a father of two small girls- I think about it alot. While solo circumnavigator Ellen MacArthur broke the proverbial 'glass ceiling' in 2005, there have been many women that my daughters can look up to. Among them Yngling sailor and Rolex Yachtswoman of the year for 2007 Sally Barkow or more recently 2008 Olympic Gold Medal winner-Lasers Anna Tunnicliff. These women are part of the new generation of sailors that are benchmarking the sport for those to follow in their footsteps. Having started in the sport at very young ages- they serve as an inspiration for many in older generations as well that gender inclusiveness is possible. I see this at times in selling boats to couples. I'll hear- "Oh that's ok- he drives, I crew" or "It's his toy". I often challenge the status quo and ask- "OK what happens if he can't sail you both back in to the harbor?" I usually get blank looks. To which I respond- "I have a book I need you to read. It's called: It's Your Boat Too by Suzanne Giesmann. " Read it and let me know what you think. A few year's back we had Suzanne out to Strictly Sail to speak to our Beneteau owners about her book. There were many who stood behind, looking for a second to share Thank You's with Suzanne about her topic. At the conclusion, it seemed generational but It appeared that progress had been made. I hope it continues. One hurdle down- a few more to go. Bill Pinkney is one of a handful of sailors who have transcended the racial lines in the world of sailing. . The African-American sailor with origins in the Bronzeville neighborhood of Chicago was first exposed to sailing in the Naval Reserves. He has gone on to inspire many young black sailors to take up the sport. Bill still is one of a handful who have done so. If you look through the archives of the National Sailing Hall of Fame, you'll be hard pressed to find other minorities that have set benchmarks in the sport. We are at the forefront of a shift in the sport, while those of us in our third, fourth or fifth decade of life might say that it's still an oddity. All one has to do is look at the ranks of the small boat sailors and you find individuals like Augie Diaz, the cuban born Snipe sailor or Olympic windsurfer Nancy Rios to see the changing face of sailing. Small sailing vessel classes such as the Hobie 16 are proving to be incubators for hispanic sailors as well. As one of the largest and fastest growing ethnic groups, I can only hope that this trend continues. Our sport needs to continue to grow. What's best for the sport is inclusiveness at the gender and ethnic level. It will require strong junior sailing programs at the yacht club level. Feeder programs such as the Sea Scouts that provide exposure to the sport for inner city children. Programs such as Rickover Academy (an innovative program in the Chicago Public School network) that exposes Chicago teens to the maritime arts. It takes hard work by all of us. It requires all of us to invite and continue to invite people new to the sport. Who knows when it will make a difference in someone's life and set off a chain of events that leads to their growth in sailing. At the recent Mac awards dinner, Karma Sailing Group had the honor of sponsoring a cadet from the Rickover Academy at our table. Our cadet was a sophmore at the Academy. When I asked if she had been sailing yet, she replied "No, but I plan to next season". She struck up a rapport with my wife Sonia. We shared that we had two young daughters that we hoped would grow up in the sport. "It's important" our cadet echoed. "It helps with so many things in life to be exposed early to things." Profound words from one so young in age. I look forward to the day when I can go to a regatta or walk down the docks and ALL types of people. Our sport needs this. That is when I'll know sailing has hit the mainstream. That's when I'll know that the hard work in promoting the sport has paid off. I invite you to share your thoughts on this subject. E-mail me your comments or post them on the blog. This spring, I helped a new client sail their new Beneteau 49 from Burnham Harbor in Chicago, north to their new boat slip at North Point Marina in Winthrop Harbor. The Beneteau 49 is another Berret/Racoupeau design which means it is well laid out, easy to manage, and best of all a great boat to sail. We left the harbor in a moderate westerly breeze, turning left at the sea wall at the southern end of Northerly Island and headed north toward the harbor entrance to North Point Marina. 12-18 knots true wind speed dominated most of the trip north, with tight reaching, and event beating windward at one point for about 20 minutes. We even got the brand new cruising spinnaker up for over half an hour and were topping boat speeds approaching 10 knots. I wasn't surprised at how easy the boat handled in those conditions, as all Beneteaus are well managed by a minimum of crew. There were three of us aboard, plus the family dog, and we all had smiles on our faces for the entire trip! The Beneteau 49 cockpit is very roomy with the 14'9" beam being drawn almost all the way back to the dual helm wheels. It has a large cockpit table with ice box and two drop leaf fiberglass table leaves. The aft end of the cockpit table has a swiveling chart plotter/radar holder with Raymarines new E-120 system. I like the swiveling plotter because you can set it up whether you are steering from the port or starboard side. It is easily seen in bright sunlight, and it has differing back lighting options for night time use. The middle helm seat easily folds up and allows for unhindered access to the teak covered swim platform. This is great as you can go from the water to the inside of the boat fairly quickly if you needed a towel! All the lines are led aft to four winches in and around the cockpit. The main primary winches are located in reach of the helm, so the driver can easily adjust the genoa sheets and drive at the same time. We also had an electric Lewmar main sheet and halyard winch on the cabin house which made for easy furling and unfurling of the sails. When we were getting close to our destination, we started the 76hp turbo Yanmar diesel, furled in the sails, and motored at about 8 knots till we were inside the harbor. Then, once we figured out which dock slip was ours, we used the bow thruster to help us back in. There were plenty of "helpers" waiting to lend a hand as we backed in, but I think they just all wanted a free tour of the new Beneteau 49. A truly great sail. We made the 38 mile trip in about 5 1/2 hours on the water, dock to dock. This particular boat is the two cabin version, with large owners stateroom aft and guest stateroom forward. The customer also had us install a convertible dinnete table to add another double berth for more guests. The 49 has a beautiful varnished interior, with the new Alpi wood that the Beneteau wood shop in France is supplying for all their new models. The boats interior space is designed by Nauta Design Group, well known for their interior design on some of Europe's most significant Mega Yachts. The open design is well thought out, spacious, and allows for plenty of storage. The 49 even has recessed "mood lighting" in the main saloon, which I also think is very nice. 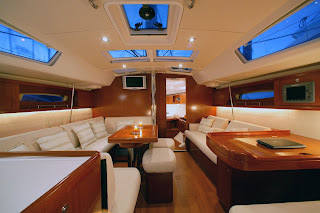 The Beneteau 49 was a winner in these client's hearts and can capture yours as well. Call Karma Yacht Sales to find out more or to schedule an appointment to see one first hand. 877-Karma-Y-S.
One of the pleasures and perks I have working for a sailboat dealer is that I get to go sailing with our customers as part of my job. We also get to try out some of the new boats that we receive for sale, especially around summer boat show time. I have had the great pleasure of sailing our new Beneteau 46 several times late this summer. I'd like to share my experiences of my first sail on this Berret-Racoupeau designed boat that is built with pride in Marion, South Carolina. I arrived at the harbor with a friend from Australia the other day, and I decided to show him what Chicago looks like from the warm waters of Lake Michigan. This was my first time on the new Beneteau 46 as well, and we were both very pleased at not how the boat sailed, but how she handled around the marina and how easy this boat was to control. We left the dock, aided by the 6hp bow thruster, made a two turns to starboard, and off we went! As soon as we left the marina, I depowered the 54hp Yanmar diesel, unfurled the main sail, and we started to accelerate nicely in the 10 knot breeze. My friend Chris, took the helm and we headed out into the lake. Now came time to unfurl the 140% genoa, and we quickly reached hull speed on a tight reach with the winds gaining up to 15 knots. My first thought was that for a boat of this size, I was surprised to actually "feel" the acceleration, much like a smaller lighter performance boat might take off after adjusting the geona lead or easing the main sheet. 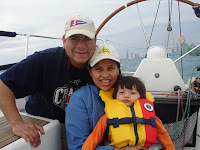 Here we were, just two of us easily handling the boat and enjoying the afternoon and the Chicago skyline. We sailed for a couple of hours that day, catching up on current events ( we hadn't seen each other for about 7 years), and enjoying the day. Switching back an forth between the dual wheels of this boat is also very easy. Because they are cabled together, you not only get a great "feel" in the helm but it is just a matter of letting go one helm and holding onto the other. Today's sailboat designs bring the beam of the boat further aft, allowing for a larger aft cabin below and much larger cockpit. As sailors, we buy a boat to spend time outdoors and this larger cockpit accomplishes just that. Most sailors like to steer from either the "high side" or "low side", depending on personal preference. I'm a "low side guy", and because of the beamy aft cockpit, one would either need two wheels like today's cruising designs, or one great big wheel, more like the older racing boats that you see in the harbor these days. The two wheel design allows for easier cockpit to swim platform access, and easier movement on the boat. Outfit your new 46 with a nice matching bimini and on this particular model, you have almost as much cockpit space as you do main salon space (a feature envied by our competition). With all control lines led aft to either the two cabin house winches or to the two primary genoa sheet winches, the boat is very easily single handed. Both Chris and I are fairly accomplished sailors, however this boat could easily be sailed by someone with limited sailing knowledge and some short training. To make things easier, our stock boat had the optional 'bow thruster' which makes pulling in/out of your slip a breeze. The sail plan offers unlimited trim possibilities as both main and genoa are roller furling sails (there is an option on all Beneteaus for you to choose a conventional horizontal battened main sail called the "classic sail"). I find the roller mains to be just great, especially now that the sail makers and mast builders have figured out a way to put vertical battens in the mainsail (this gives you more sail area than the conventional furling mains of years past). As we were heading in the wind started to die out, however we were still sailing at 5 knots in about 6 knots of breeze. This boat would not give up on us. I think she was enjoying the afternoon as much as we were. We finally started the Yanmar engine when we were about 400 yards from the harbor entrance and furled in the sails. We did not even have to use a winch to help us. Perhaps in a breeze a winch would come in handy, and both furling lines are led to the cabin top winches for easy use. I found that the 54hp Yanmar propelled us at just over 7 1/2 knots at about 2400 RPMs. Plenty of speed to get us where we were going and at the same time, because of the lower RPMs, the cabin noise inside the boat was kept to a minimum. Once we reached our dock, I used the bow thruster to help me back the boat into her berth and we tied her up for the next sail. While walking away from the new Beneteau 46, we both stopped and looked back at her sleek lines and sparkling beauty. I thought to myself "what a great boat this is going to make for someone, and what a great job I have!" Wow, I went a whole day without checking on the stock market every hour or so. Have you been able to do this yet? It is certainly harder to do right now, but I think it is therapeutic in a way, as I don't plan on selling anything in the near future so it is all paper losses right now. Right about now is the time I begin missing sailing quite a bit. It is usually right around now, mid-November, that I start to really crave it again and want to get out there. The craving is something that I have grown accustomed to, and every year it comes back and I want to get out for a couple hours to clear my head. Does anyone else feel like this? Maybe it has to do with the realization that it's going to be cold soon and will be a few months before I can get out there again. Then, you get a few teaser weather days where it is not too cold, with plenty of south wind, and you begin to think how to possibly get out there, sailing, for part of the afternoon. One solution that a lot of people I know have done is to spend a vacation by heading down somewhere warm like the BVI's to rent a charter sailboat. That would be a great way to get a winter sailing fix without having to deal with 40 degree water and frost-bitten fingers. Moorings, and some of the smaller fleets, have a lot of different Beneteau models in their fleet, so as a Beneteau owner, it wouldn't be like any of us was 'cheating' on our brand or anything. My rationale is that the kids are starting to get old enough to where we could either bring them with us, or have them stay with family for a few days. Either way, they would think they were on a vacation. Maybe this is something that the whole Chicago sailing community could think about and do collectively one year, get a couple hundred Chicagoans to head down and take over the BVI's for a week. Promise me you'll at least consider the idea. I may even put up a picture of the palm tree on the desert island in my office, or maybe I'll just select that beach photo for the background of my Blackberry. Feed the appetite, so to speak. If I do go, I promise I will write about it without gloating when I get back. Earlier this fall, I had the opportunity to sail one of Beneteau's newest models, the Beneteau 31. With an LWL of just under 29 foot, she proved to be quick, responsive yet steady while retaining the creature comforts of boats much larger than her. The boat I sailed had the standard 5'11" draft, battened classic mainsail and 105% roller furling genoa (all standard from Beneteau USA). Under motor-she was powered by a 20hp Yanmar 3YM30 diesel engine. There were five of us aboard that afternoon. 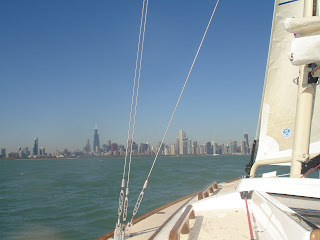 We left Burnham Harbor in Chicago with a 10-15 knot breeze from the east, and a beautiful-blue cloudless sky. After only taking about 35 seconds to hoist the main, we bore off to port and headed for the Chicago light house (an historic landmark built on the outer seawall of Monroe Harbor in Downtown Chicago). We moved along nicely in the 12 knot breeze, and headed out between the break wall entrance and the lighthouse. All the while doing so with ease and gracefulness. The thing I liked most about the boat at this point was how well she tracked up wind, with what I'd call a modest 'slot'. I thought that she will be very easy for the beginner, and a joy to sail for the seasoned sailor as well. We put her through her paces while sailing up wind, reaching, down wind sailing and motoring in over a period of a few hours. She was just as easy to dock as she was to sail, and I will look forward to going out on her again! Sail Magazine just completed a review of the new Beneteau 31 and you can read it here. We have hull #22 in-stock. Call us to visit this great sailing boat. Take advantage of our Thanksgiving Fall Deals. These are our best prices of the year. Call us for details. Don't Get Caught Up in the headlines. The blessing in today's information age is the immediacy of news information which is sometimes being reported as it happens. The curse in today's information age is the immediacy... I think you get the picture. It is very easy to get sucked into the negative news these days. I mean it is EVERYWHERE. You turn on the radio in the car and you have twenty stations with pundits all providing commentary on what 'they feel' is going to happen with the economy. You get to the office, log onto your homepage and see the bombardment of negative news. The ride home, more of the same. The news at night even more of the same. Click on the Blackberry- there it is- AGAIN! One thing is for certain- I really would like to be Rupert Murdoch these days as his toe-hold of the news industry has to be paying dividends beyond all belief. At first- I thought it was because we are in an election year. But what I fear the most is that this is the new age of information: talking heads, 24/7 on every media avenue possible. I'll admit- it's like a car crash- everyone has to stop and look. I'm guilty of it. After awhile- it really weighs on you. It starts to effect your outlook. You get sucked into this vortex and you can feel the doom and gloom take you over. Get the paper, log on, take the information in. Where does it stop? Now don't get me wrong- I don't mean to be an escapist and disregard that there are bad things happening to people these days. I fully understand we are in a predicament as a country. The one thing to remember is that we are ALL in this together. I do, however, strongly believe that the media is helping advance the fear because it helps them sell advertising, it helps them sell papers, but most of all it gives them something to talk about. How great a world would we live in if you opened your paper one morning to read the following headline: "Class of 14 Inner-City Children Learn to Read". The fact is that there are classes around our country of at least 14 inner city kids and they are learning to read! Sound obvious? Yes. Does it sell news papers or stop you in your tracks to watch CNN? NO! Advertisers would not pay CNN millions to run ads if their percentage of viewers went down. Sam Zell would have less to value in the the Tribune Company if people cancelled their subscriptions due to excessive good news. So my point is very simple. Don't get caught up in the headlines. Focus on the good things that are going on around you. Put things in perspective. But most of all- let's continue to believe in this great country of ours. We are in this together. We got into this together. We will have to climb out of this together. Don't get caught up in the headlines or it WILL take us much longer to get out. The Smart Shoppers are Buying. Want to know why? With no real 'safe' investments on Wall Street, have you ever considered looking to the water for a place to put some money? It is an interesting indicator of our current times, but it is an idea to consider: the ability to have it all while still regaining some stability with regards to your assets. Look out at Lake Michigan. It is now empty for the winter, but when it was full of boats, the dock that held a new Beneteau sailboat was a much safer investment than any that you would find on Wall Street today. Beneteau sailboats have fared extremely well in the realm of what few things can be considered good investments these days. Here are the numbers: a Beneteau sailboat is holding its value so well that after five years of ownership, it is still worth an average of 92% of its original value, a depreciation rate of just 1.6% per year*. That value has recently become even greater with the introduction of Beneteau's own Stimulus package of price incentives, electronics, and options offered in the price. Sure, full disclosure is that we are a dealer selling a product. But currently, this product has proven to be one of the safer, more tangible investments you can make; one that also promises to pay dividends and rewards in ways that cannot be easily measured. Sailing is truly a lifestyle. For many, it is not just a hobby, it is as important an activity as one's exercise and, similar to exercise it will reduce stress, increase mental health, and also keep you fit. As bad as it has seemed this fall, the world is not going to end. In addition, we Americans are not going to stop appreciating quality time with family and friends, or the ability to get away once in awhile. Being on the water-sailing-has long been the most sought-after summer activity for those who know how revitalizing it can be. A Beneteau sailboat is now a genuine, sensible solution for the question: where can I safely invest my money? Now more than ever, you can get a lot of Beneteau for your money while having confidence that it will not disappear off some balance sheet or financial statement. *Information based on Fresh-water, Lake Michigan-sailed boats. It should come as no surprise that as a parent of two small children- sleep is a commodity that is hard to come by at our house. So this morning I was having one of my bouts of insomnia and I decided to channel surf a bit. I ran across a movie titled 'Canvas' starring Joe Pantoliano and Marcia Gay Harden. In reading the TV review it look to be something I could use to fill my lapse in sleep. The movie is about a young boy who is struggling to fit in. His mother suffers from schizophrenia. His father (Pantoliano) is working hard to make ends meet and keep up with his mother's (Harden) medical care. A turn of events forces hospitalization upon the mother to treat her illness. The father (being a non-communicative type) struggles to deal with the situation that has fallen upon them. He misses the woman that he met, fell in love with and married. He comes up with a coping mechanism to help him deal with things. He decides to build a sailboat. 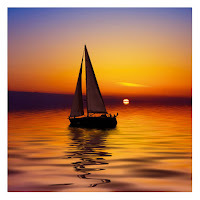 The sailboat is significant because the father first met the mother while taking sailing lessons. Their first kiss was on a sailboat. He struggles while recollecting the past and he longs for a return to those days. He is overcome with the rich memories created while sailing and taking lessons. Meanwhile, the son is dealing with his own loss of a parent. He is angry at the turn of events. He fears that he will become afflicted with the same mental illness. Long story short- the father and son connect while building the boat. They endure a series of additional challenges during the building of the boat, but eventually they finish it. The father teaches the son to sail- they create new memories of their own. They share this new memory maker with the mom. I won't tell the ending because you'll have to see it. But hopefully, you get the sense of the movie. OK- so this has a bit of Hollywood spin to it. My point in sharing this movie and it's story line is that metaphorically, a sailboat has a magical power. Beyond the wood, fiberglass and sails- it represents a common passion that we share with those we love. Much like the family in the movie- often times family and friends share this with us. As human beings- there is a communal element to us as a species. For some it may be the summer cottage on a lake someplace that holds sentimental value. We value the role it played in helping us create memories. For sailors, it's our boats. I was speaking to a client and his daughter recently at the Annapolis Boat show. Independent of each other, I asked them how their first year of ownership had been. They both lit up when I asked the question. She shared that the boat represented a great new common point for their family. She was impressed at the new level to which the relationship between her father and her nephew had evolved. The young sailor had found a connection with his grandfather. A connection that transcended any generational gap. "It's a beautiful thing" she shared. "He is so hooked on sailing and It's because of the boat. He has something that he can relate to with dad." For the grandfather- his response was "It gives me something to share and pass on to my grandson." I hear this quite a bit from many of our owners. It is truly an amazing thing. After 9/11, there was a huge surge in people looking to reconnect with loved ones. It was a sign of the times due to the circumstances. It was people stopping and realizing the finality of our existence on the planet. Our realization of the fragile nature of human life. For those of us who have owned boats- we know it has always been there. The passion for these boats and what they represent to us. What they represent to our families. We just need to relish in the moments and continually remind ourselves of the value it brings to our lives. I can fully relate to this. Given the nature of my business, I understand and respect your potential skepticism. My wife and I had our chance 'first date' (her version is a bit different) on my sailboat. We were able to spend four hours on the water during that afternoon. What a perfect first date. It allowed us to get to talk, share laughs and relate through our similiarities. Our daughters, nieces and nephews have all been exposed to the sport at very early ages. Our daughter Sofia- has become quite the lover of sailboats in her two short years of life. She first went sailing at the tender age of six months. We took photos to commemorate the event. She has one in her room and always points to it- "Sailboat daddy?" she says. It truly becomes a part of you. A part of your blood that many who do not sail can't begin to understand. A ritual of spring, summer and fall. With the hectic schedules we all lead, it is the one place we can find solitude. In these times, the one place we can get away from all the media negativity about the world. Ron Lieber speaks of this in his NY Times Article: "Some Purchases May Still Be Worth the Price". Ron reminds us of how short life is and how (in the end) it's the memories that live on. You cannot measure the return on investment for a boat in dollars and cents. I t's the fond memories that will last for years to come that are your R.O.I. It is the memories that enrich our lives and help us get through the tough times. If you believe the gloom and doom media, our country is on the verge of falling apart. "We may cease to exist as the United States", one reporter inferred recently. It is now more than ever that we can use our sailing fix. The shame is in the Midwest, we will need to resort to screen savers of boats and talking about sailing through the winter months. Call me an escapist- but I NEED my hydro therapy! One of my favorite pictures of this past year is the one shown above. It has also become one of my daughter Sofia's favorites as well. We got some friends together and went out on 'Karma' on a moment's notice (those are some of the best sails). My wife was five months pregnant in this photo the day we went sailing. The thing I like the most about this photo is that I will forever be able to show that photo to my daughter Sarah (born this past August) and say "You were there on that day too." Now that is what sailing is all about. Do you have a good sailing memory or story? Share it below on the comments. I would love to hear it. With all that is going on in the world it is easy to get wrapped up in the constant media bombardment of the Economic Crisis, Real Estate Bubble Bursting, Lending Crisis and numerous other ‘issues’ plaguing our society. I’ll be the first to admit it is real easy to pick up the paper or go online and be sucked into all this negative spin. Add to that an election year and it really can start to weigh you down. It’s been almost two months since I stepped foot on any boat to actually sail it. Sure- you’re probably thinking- he gets to sail all the time. ‘The grass is always greener’ is my response. Seriously,the last time I was on our boat- was during the Beneteau First 36.7 North American Championship in early September. It came at the end of a really long season of sailboat racing. Having our boat damaged during that regatta left me with an empty feeling in my stomach. Out of avoidance- I had not stepped foot on the boat since. Yesterday afternoon- I had the opportunity to escape and get a quick sail on our stock Alerion Express 33. We’ve all probably heard the phrase- ‘the water was calling me’. Well it was a little of that, plus the fact that the wind was just right and the temperature was not bad either. I think we (sail boaters) sometimes take for granted what a true pleasure it is to JUST SAIL. You know- just turning off the Smartphone- heading to the harbor and completely disconnecting for a short while. Just being one with the sun, water, waves and the wind. Just feeing the wind in your hair as you get the boat up to speed and take it all in-it is a true blessing. It always seems to come at the most appropriate time. The ‘taking for granted’ may be a bit less here in Chicago where the winters can be so fierce sometimes and the summers so warm. When I lived in Miami- the complaint at the harbor was often- ‘it’s too hot’ or ‘it’s too windy’. Why because there are so many things to do in an area that has warm weather year-round. But here in Chicago- we treasure our sailing days so much more. It is very noticeable as you see people heading out on the ‘very windy days’- or with potential clouds overhead. Why? Because they can! Add to that this great skyline and a warmer than usual fall and WOW! There is no better way to enjoy our great city. All of the sudden-(if for just a brief moment) - we forget the ‘ills of the world’ and the pressing ‘things to do’. Temporary- I know- but the feeling is second to none. It is truly therapeutic. So if you’ve not gotten your dose of medicine lately- find a way to get out on the water before the weather turns- Just one more time! Boat Maintenance: 10 Things You Can Do Now to Prevent Headaches in the Spring. a. Warranty Item List: These are items that are still covered under warranty. Call your dealer with any items that need attention on the boat prior to next season. Communicate your list in the fall, as we have plenty of time now to plan, order parts, and do the work. Too often- everyone puts their boat away for the winter and then remembers everything a week before being splashed. Add to this- springtime weather challenges, a full springtime commissioning schedule and you will minimize the chances of your issues being handled. b. Things to Upgrade or Replace: Make a checklist of the things you might want to replace as part of your routine maintenance or upgrade (lines, halyards, light bulbs, head pump, electronics, etc.). Most marine supply stores usually have deals or sales over the winter, and you won’t have to wait in line in the spring to get them at retail. (2) Proper Winterization of Systems: Make sure you have properly winterized your boat. Whether or not you have hired someone to do it for you, or you are doing it yourself, check and double check all the systems that need winterizing. Don’t forget seldom used pumps like the manual bilge pump, refrigerator drain pump, and transom shower head. You can visit the Karma Yacht Sales website for a list of winterization recommendations. (3) Protect Your Fuel: Make sure your fuel tank is topped off, and that you have added fuel additive to prevent growth of bacteria in the tank over the winter. Believe it or not, bacterial grows in diesel fuel, and the absence of water or air in the tank helps prevent it. (4) Don’t Forget the Batteries: Make sure your batteries are fully charged before winter, or remove them completely. Check the fluid levels in them, and top them off if they need it. Fully charged batteries have much less chance to freeze, and will last longer over the boats life. If you have an older boat, remember that the life span on marine type batteries is typically 5 years. If you are thinking of buying new batteries, you can usually get them less expensive in the fall. (5) Spider control: One mariner’s trick is to place a couple of plastic containers of moth balls in different cabins. Leave them open. The camphor in the moth balls serves as a natural and humane spider repellant. It will make for less ‘intruders’ in the spring. (6) Running Rigging: Make sure all your halyards are properly secure, or that you remove them completely for the winter. If removing for the winter, use a heavy “tag line” for replacing them in the spring. No one likes to go aloft in the spring to replace an unsecured halyard, or re-feed a halyard because the “tag line” was too week or broke over the winter. (7) Sails: Just as important as your engine: Take your sails to a local sail maker for a “check and repair” service. This simple inexpensive task could and will add many years of life to your sails, and it also solves the problem of storing them over the winter in a controlled climate (prevents mildew). Ask us for some recommendations. (8) Don’t Forget me: Clean the boat inside and out when she first comes out of the water. Clean up any water in the bilge or water that may be inside any of the compartments in the boat. This will not only prevent mildew from appearing, it will let you know if you might get any leaks over the winter that can be stoppable. Starting with a dry boat is half the battle. You have one last job left for the spring and more time to enjoy the boat once she is back in the water. Visit the boat a few times over the winter months, just to check every thing over. I’ve seen too many folks who drop off the boat in the fall, only to come back in the spring for their first visit and walk into a nightmare! Remember those sodas from the end of season trip to the boat yard? Take them and any other perishables, food or otherwise off the boat. We can’t tell you how many times we’ve walked aboard boats and found rotting fruit or exploded cans of soft drinks (or beer) in the fridge. (9) Dry is Good: Mold and Mildew is your enemy. Either remove your interior cushions, or stand them on end inside the boat to help air movement around them during the winter. If removing them, make sure you have a dry storage spot at home to prevent mildew. Leave some sort of air venting available to help circulate the air inside the boat. This will help keep the boat “fresh” smelling. Use desiccant or other drying agents throughout your boat to keep humidity down. Don’t pull your shades or curtains shut. Mold and mildew hate bright light. (10) Canvas: If you have a dodger, bimini or sail cover- carefully remove them. Fold flat, being careful not to bend or kink the ‘see through panels’. Make sure to remove any loose dirt carefully with a soft brush and soap/water as needed. If there are worn spots. Have them serviced. You can store the panels in one of the cabins of the boat laying flat. A small amount of time spent now- ensures that your spring commissioning list will be shorter and assist you in getting the boat on the water sooner to take full advantage of a whole season. Did you find this information useful? Leave me a comment below. 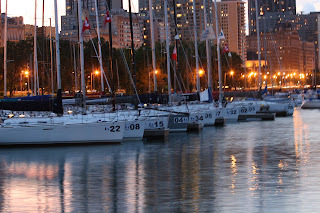 This serene view was the early evening backdrop at Belmont Harbor this week as over 30 Beneteau First 36.7's competed in the First 36.7 North American Championships hosted by Chicago Yacht Club. Boats representing as far away locations as Toronto, CAN and San Diego, CA participated in this day regatta that ran September 3-6.